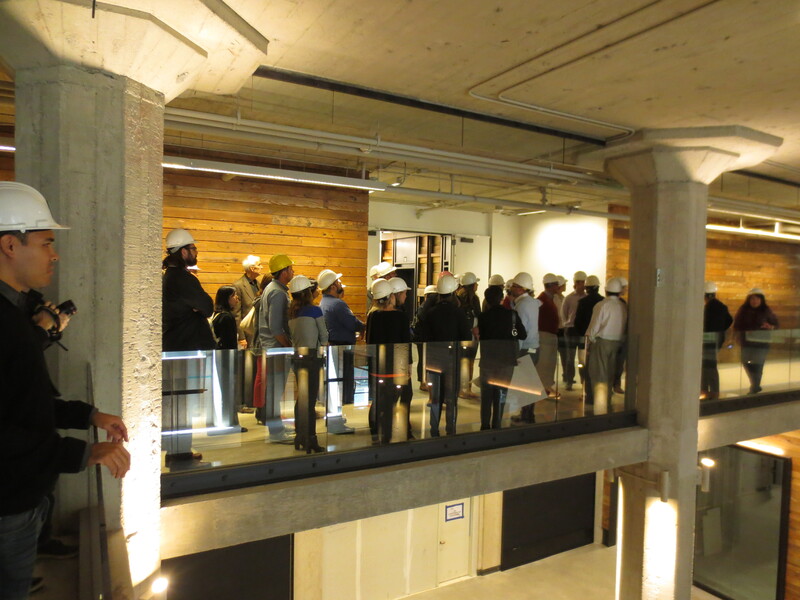 Last Wednesday, RMW architecture & interiors’ San Francisco studio took a hard-hat tour of Market Square and 1 Tenth. Although RMW’s design team of Terry Kwik, Steve Worthington, Ron Aguila, Tom Tessier, Joe Pirrone, Darren Barboza, and Gloria Rasmussen has been working on the core and shell improvements to both buildings for more than a year, for most of us it was our first time on the job site and our first glimpse of the true scale and feel of a space that promises to be a game-changer for Mid-Market. Market Square, at 1355 Market Street, and the building just behind it, 875 Stevenson (to be rebranded as 1 Tenth), are both former wholesale furniture warehouses. Their renovation as Class A office space and retail opens them up to the general public for the first time. 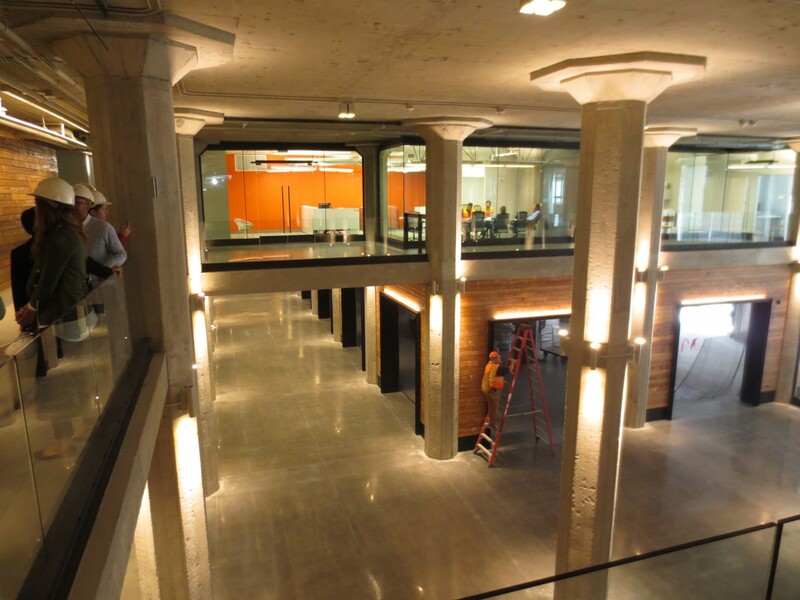 While commercial offices occupy the upper ten floors of Market Square (six floors are leased to Twitter), the ground-floor lobby and retail will be open to all in mid-August. The two buildings share an alley, which is being transformed into a pedestrian commons by CMG Landscape Architecture. As a whole, Market Square, 1 Tenth, and the Commons are envisioned as a new kind of tech campus, one that doesn’t shy away from direct interaction with its urban environment. 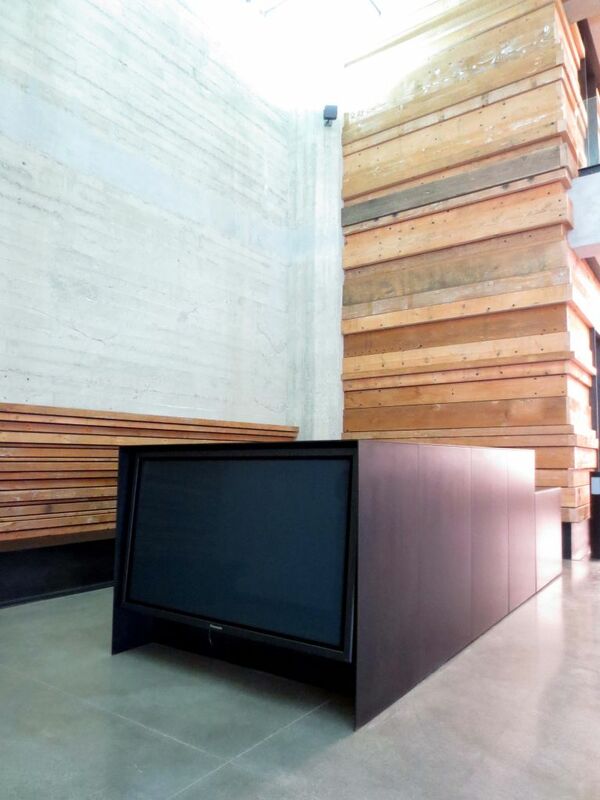 The project is a collaboration between RMW architecture & interiors and BCV Architects. RMW designed a new office lobby for Market Square in collaboration with BCV, and BCV designed the public realm in collaboration with RMW. 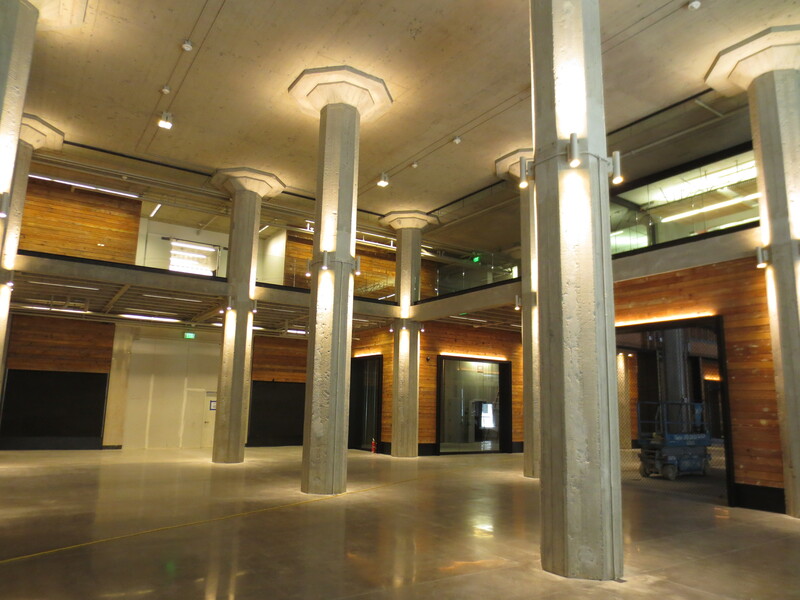 Since Market Square was a warehouse, it had minimal existing interior build-out, giving RMW and BCV the opportunity to establish circulation zones for both the private tenant and public realms. Public visitors will enter Market Square from the historic Market Street lobby (restored by Page & Turnbull) and circulate through the retail area, out into the Commons, and into the neighboring 1 Tenth. 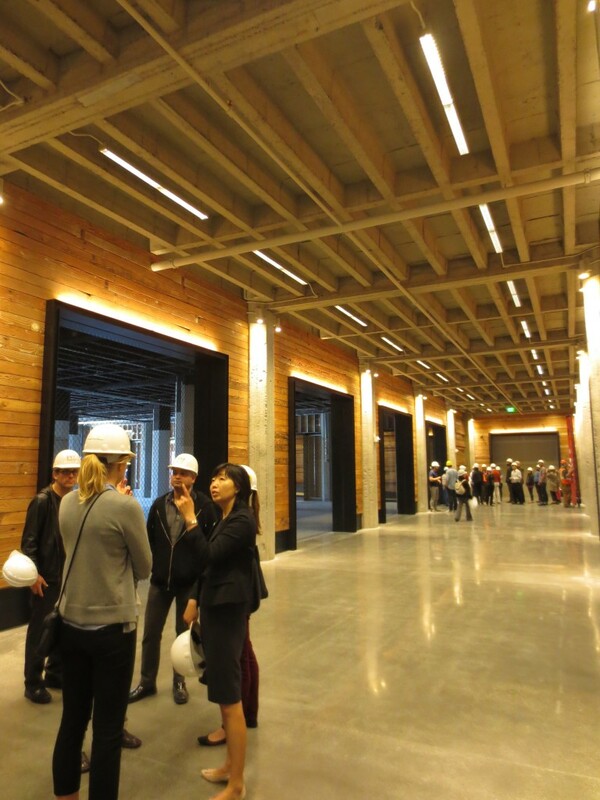 Circulation areas of Market Square are visually unified by the use of reclaimed Douglas fir beams to line the walls. 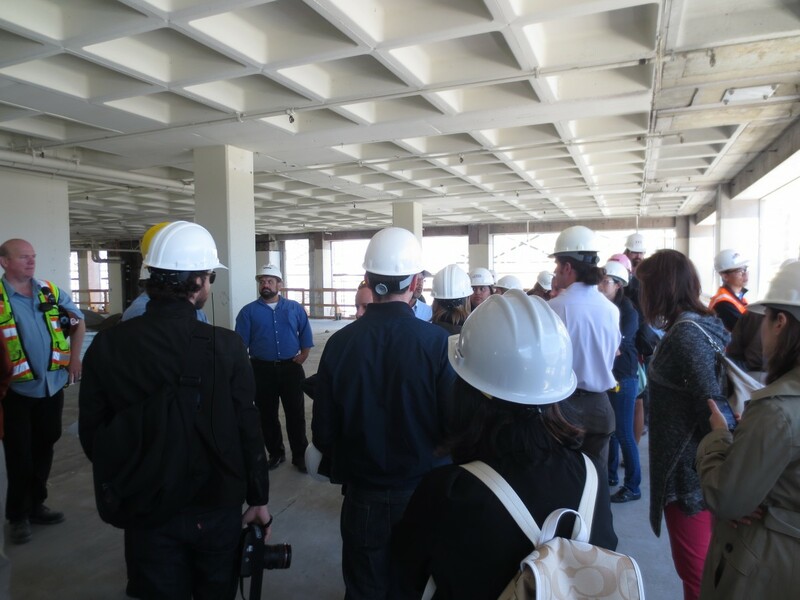 These beams were carefully repurposed from a 1940s roof structure that was demolished to make way for the Twitter roof deck. 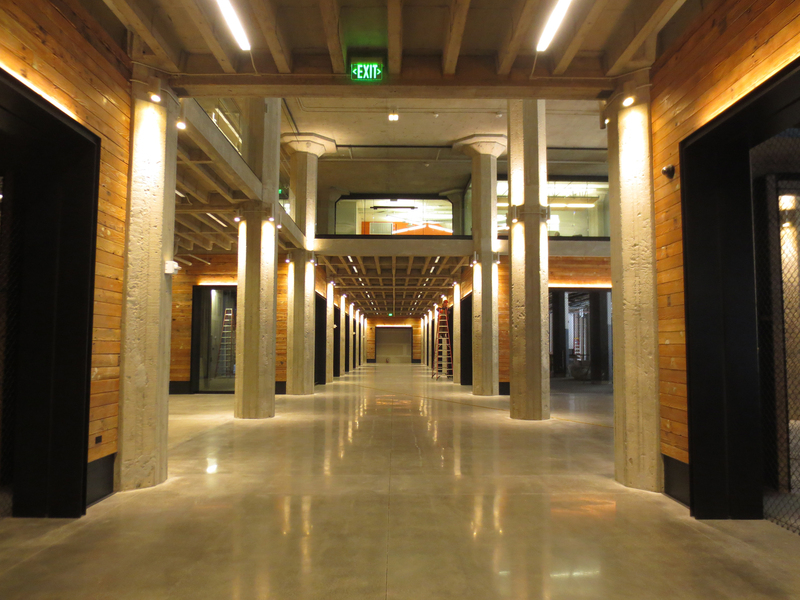 The combination of wood, raw concrete pillars, polished concrete floor, blackened steel, and glass creates lively contrasts in organic texture. As we stood in the lobby at the Commons side, we looked up into a two-story atrium that draws the eye outside, where 1 Tenth stands draped in netting as demolition of its walls continues. BCV Architects has installed glass accordion garage doors so that each storefront can open fully onto the Commons. We predict that the Commons, surrounded by its open-air food retail shops, will be one of the most vibrant public open spaces in the city when it’s complete. Our tour continued inside 1 Tenth, where BNB Builders is systematically demolishing the exterior walls to make way for a glass curtainwall that will span floor to floor outside the building’s reinforced concrete frame. In its incarnation as a warehouse, 1 Tenth was very closed off, with tiny windows and no front door. RMW’s design for the re-skin transforms it into ten floors full of light, with 16-foot-high glass panels, while also adding 1,276 square feet to each floor. 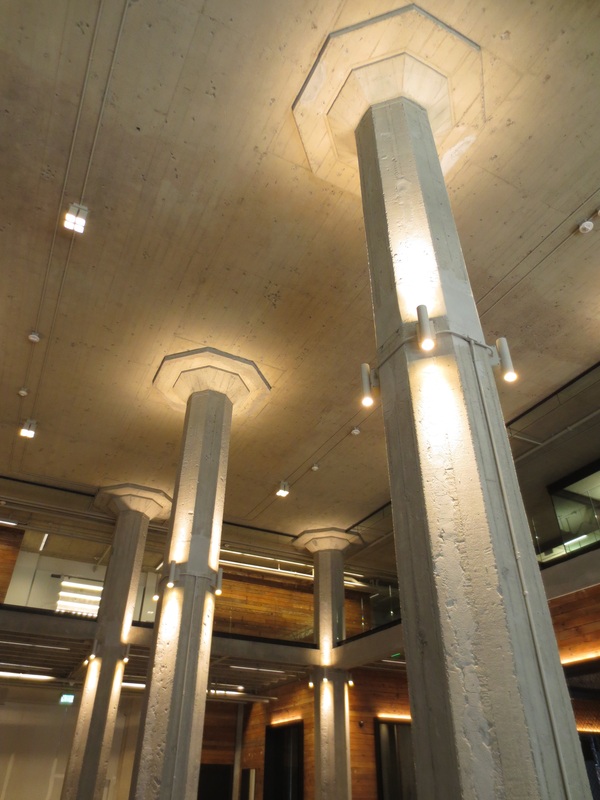 In addition, dropped ceilings were eliminated, exposing the waffle slab construction and emphasizing the long, lean span of the floor plates. 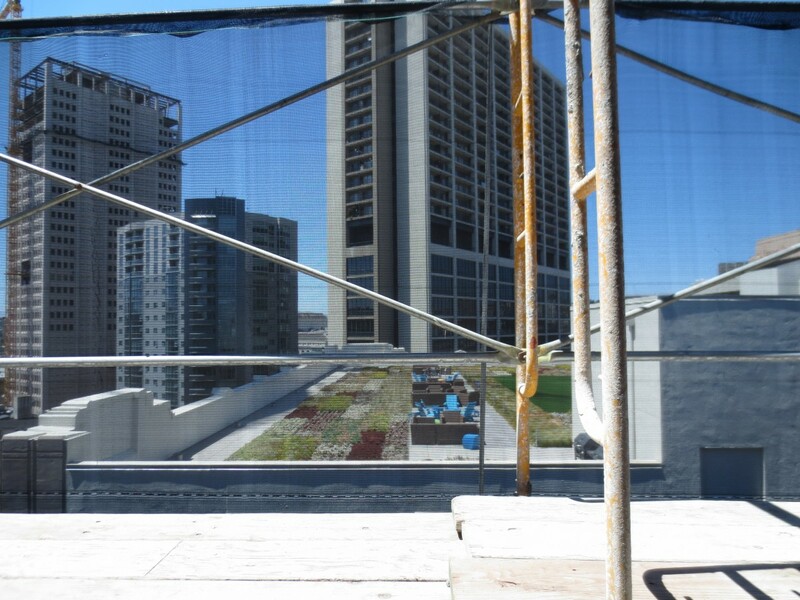 To read more about Market Square and 1 Tenth’s background and design approach, see Terry Kwik’s Think entry, “Beyond Twitter” or visit the project page. We’ll continue to post updates as this exciting project proceeds.